A study shows that all five of Asia’s major river systems will be affected by glacier melts caused by climate change. AsianScientist (Jun 26, 2014) – Climate change will cause water levels in Asia’s five major river systems, that are fed by Himalayan glaciers, to increase at least until 2050, a new study predicts. Led by Arthur Lutz, post-doctoral researcher at Utrecht University, the Netherlands, the study predicts an increase in water availability for the upstream basins of the Indus, Ganges, Brahmaputra, Salween and Mekong river systems at least until 2050. 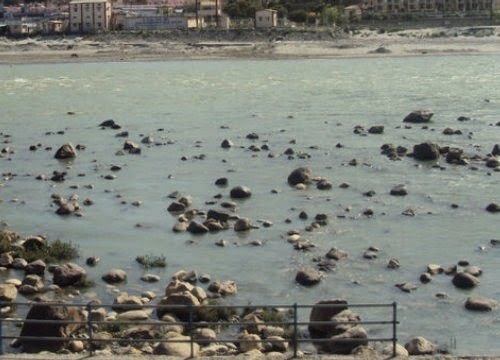 “For the upper Indus the increase is mainly caused by accelerated glacier melt, while for other basins the major cause is increasing precipitation,” says Lutz, who is also a researcher with FutureWater, a research organisation in the Netherlands. The study published in Nature Climate Change uses the latest climate models and these project a stronger increase in precipitation. According to the findings, the amount of glacial meltwater contributing to the total flow in all basins does not change much at least until 2050 because the decrease in glacier area is compensated by an increase in melt rate. Glacier and snowmelt contribute water to 10 important river basins originating from the Himalayas and the Tibetan Plateau and serve over 1.3 billion people. The study confirms on a larger scale what co-author Walter Immerzeel observed last year in two watersheds in the Indus and Ganges basins. His 2013 study in Nature Geoscience predicted that while climate change will cause the Himalayan glaciers to reduce in size, the runoff from glacier catchments will increase. The new findings will inform climate change adaptation policy makers in several countries. “This study will help bridge understanding among countries that share trans-boundary rivers regarding the change in distribution of water throughout the year and help tailor appropriate policies,” says co-author Arun Bhakta Shrestha from International Centre for Integrated Mountain Development, Kathmandu. Local experts say more work needs to be done to understand changes in monsoon patterns and water availability which are critical for farmers. “Climate change is expected to disrupt traditional cropping calendars, so we need better prediction on the timing and volume of rainfall to better cope with water-induced disasters,” says Madhav Karki, senior researcher at the Institute for Social and Environmental Transition, Kathmandu, which works on sustainable development practices. The authors accept that the frequency of extreme events has not been addressed in the study. “The challenge is to include this aspect when we want to make predictions about changes in the frequency of floods and droughts and also extend the projections to the end of the century (2100),” says Lutz. The article can be found at: Lutz et al. (2014) Consistent increase in High Asia’s runoff due to increasing glacier melt and precipitation.